The sporty-elegant diving watches in Longines' HydroConquest Collection are perfect for every occasion, whether at dinner, the office, or the beach. Affordable column wheel chronographs are the highlights of this series. Watches in the HydroConquest series are diving watches with luminous hands and indices; a unidirectional, rotatable bezel; and a screw-down crown and case back. These Longines watches look good with casual wear as well as a suit thanks to their sporty, elegant designs and moderate case sizes. Seeing as the cases are comparatively flat, you can also wear these timepieces with a long-sleeved shirt. Divers get their money's worth with watches from the HydroConquest series: the cases are waterproof to 300 m (30 bar), making the timepieces robust enough to accompany wearers on dives. The band's diving extension is very practical and allows stainless steel bracelets or rubber straps to fit tightly around a diving suit. However, this is also a useful function for non-divers. When temperatures rise during the summer, your wrist can swell, and an extension prevents the band from becoming too tight. There are also chronograph models available. 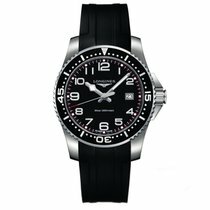 Watches from the HydroConquest Collection are versatile, affordable timepieces for any occasion. How much does a HydroConquest cost? A pre-owned three-hand HydroConquest with a date display costs around 700 euros. New models are only slightly more expensive, costing around 800 euros. If you want an automatic bicolor version, you should plan on spending at least 900 euros. Pre-owned automatic chronographs are available for around 1,000 euros and new models cost a bit more, around 1,300 euros. Standouts in the current chronograph range are those with the column wheel chronograph caliber L688. Column wheel chronographs are considered to be of a higher quality than the popular shuttle chronograph movements (such as the Valjoux 7750 ). 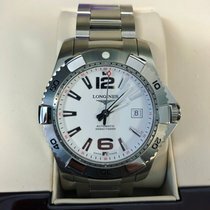 A pre-owned three-hand quartz Longines HydroConquest can be purchased for less than 500 euros, while a new version costs around 700 euros. A bicolor gold-plated model costs around 800 euros new. There are also pre-owned quartz chronographs from the collection available at this price. New, they usually cost at least 900 euros. Thanks to their precise, battery-powered movements, these chronographs can time to 1/100th of a second. The following models are available with a 41-mm stainless steel or bicolor case. 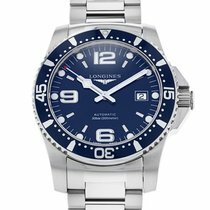 If you're looking for an affordable, stylish diving watch with three hands, then the Longines HydroConquest with reference number L3.642.4.56.6 is the perfect model for you. It's waterproof to 300 m (30 bar) and robust enough for you to wear while swimming, snorkeling, or diving. The luminous hands, indices, and Arabic numerals shine bright green in the dark, so you can still read the time underwater, in a movie theater, or at the opera. The unidirectional rotatable bezel also has a luminous zero marker. The minute scale on the bezel makes it easy to read how much time has passed since the start of your dive. The polished sides of the case and bracelet links give the watch a refined look, making it the perfect companion to a nice jacket and dress shirt. The relatively flat case underscores the watch's overall elegant appearance. Another mark of quality is the use of small screws on the bracelet links. Many watch manufacturers use small, thin pins to join links on cheaper bracelets. The pins or screws are there to help adjust the length of the bracelet to the circumference of your wrist. Straps with a diving extension are especially comfortable. You can easily shorten or lengthen the rubber strap or metal bracelet of your HydroConquest with this function; if you're regularly wearing a wetsuit, then there is no need to add extra links yourself. The satinized or polished links and case have a high-quality finish and the polished crown guard, which protects the screw-down crown from jolts, has a classic look. One beautiful detail is the brand's logo which is engraved on the crown. The manufacturer uses anti-reflective, scratch-resistant sapphire glass to protect the dial. If you flip the timepiece to view the case back, you'll see a screw-down, engraved plate which securely seals the case. The automatic caliber L633 powers the HydroConquest L3.642.4.56.6. The caliber is based on the ETA 2824, a workhorse mechanical movement used in countless automatic watches. 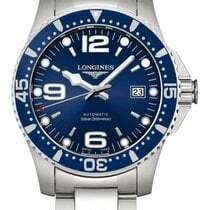 For example, the same movement powers the Longines Heritage Legend Diver, a retro diving watch from the Heritage Collection. Since the caliber L633 is automatic, it winds automatically while it's worn. Once it's fully wound, it can run for 38 hours. The balance wheel vibrates at a frequency of 28,800 A/h, equal to 4 Hz. Most chronographs on the market don't second as diving watches. Therefore, it's adequate if they're only waterproof to 100 m (10 bar), allowing you to take a swim with your timepiece on. The HydroConquest chronographs, however, are waterproof to 300 m (30 bar) and were designed with divers and fans of water sports in mind. The design resembles that of the three-hand models. The dial and bezel are available in black, blue, red, or white. Models with a white dial and a red bezel have an especially sporty look. Longines' best chronographs are models powered by the caliber L688, a column wheel chronograph movement. This mechanism is more practical than the alternative, a shuttle chronograph movement, as the push-pieces function more smoothly. 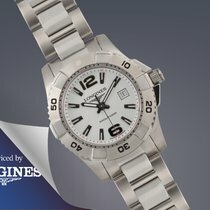 ETA produces the L688 exclusively for Longines and places an emphasis on easy servicing. Unfortunately, due to the steel case back, you can't view the beautifully engraved caliber with perlage at work. If you prefer a column wheel chronograph with a see-through case back, then the model L2.786.4.56.3 from the Conquest Classic collection is a better choice. At a price of 2,100 euros, it costs a few hundred euros more than the HydroConquest chronograph.